Price includes taxes in Canada. Price includes taxes. Free shipping over $100. Cover an air pump or any other pondside or backyard device. This vented artificial rock housing blends into the landscape, letting you keep your pond pump protected and dry. Faux Rock (Artificial Rock) Housing for Air Pumps. Hide your air pump under this vented faux-rack. 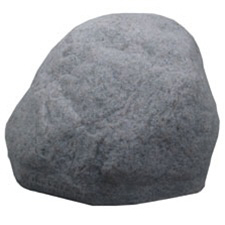 It looks like a real rock so will blend in with your pondscape. Dimensions: 16" x 15" x 10"
Color and texture will vary from photo...just like a real rock! What didn't you like about this product? Quebec, North-West Territories, Newfoundland & Labrador, Nunavut, Manitoba and Nova Scotia. Pond & water garden products in the Maritimes and all across Canada with free shipping over $100. With our three shipping warehouses in Canada (Ontario, British Columbia & New Brunswick) we provide fast shipping anywhere in Canada.